Finely chop pecans and set aside. Strip the leaves from several sprigs of thyme and roughly chop the leaves. Set aside with the chopped pecans. Slice baguette on an angle into 12 slices, approximately 1/2 inch to 1 inch thick, depending on your preference. Place slices of bread on a cookie sheet lined with a wire rack. Bake in preheated oven for 4 minutes. Cut peaches in half and remove pit. Place on a foil or parchment lined pan, cut side up. Season with olive oil, salt and pepper. Bake in 400° oven for 12 minutes. After 12 minutes, turn the peaches over (cut side down) and bake for another 6 minutes, or until peaches are softened. While the peaches roast, spread goat cheese on warm slices of bread. Return cheese covered toast to the pan lined with a wire rack and set aside. Once peaches are finished roasting, remove from oven and allow to rest until cool enough to touch, about 5 minutes. Slice each peach halve into 3 slices (12 slices total). Top each piece of toast with a peach slice. Turn the oven up to broil. Place crostini in the oven and broil for 45 – 60 seconds, keeping a close watch to ensure they do not burn. Remove from the oven immediately. 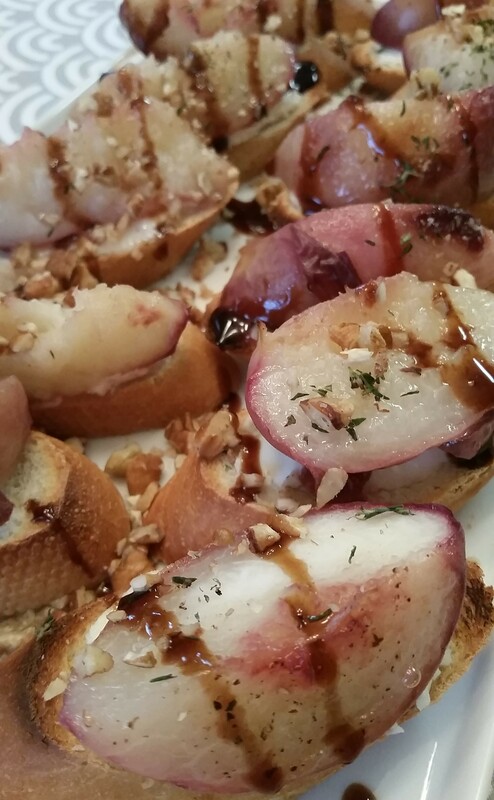 Arrange crostini on a serving platter and drizzle with balsamic glaze. Sprinkle over the chopped pecans and thyme leaves. Finish with a pinch of coarse sea salt and freshly cracked black pepper.